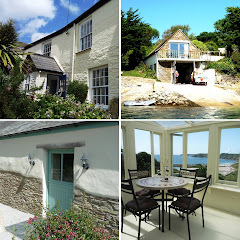 Holiday Cottages in Cornwall: More than 200 properties! We at Cornwalls Cottages are delighted to say we've now more than 200 properties on our website spread across the whole of Cornwall. We are throughly enjoying helping you pick the best property for your stay and thought you'd like to know which are our favourites. Jenna, Reservations: "When I first started work at Cornwalls Cottages in September 2009 I fell in love with Swallows in Falmouth and wanted to move in immediately. I still have a soft spot for the property! Maybe one day…"
Richard, Director: "I would always stay at Toadstools on the Roseland Peninsula. It is a gorgeous traditional Cornish cottage with authentic kitchen and a large garden. I'd take the wife for a quiet weekend away, or the kids and dog if she made me!" Jo, Reservations: "April Cottage, St Just-in-Roseland is my favourite property as we spent every family summer holiday here for 10 years. It has incredibly special memories for me and secured my love for Cornwall which resulted in me moving my family here! It is warm and cosy, with comfy sofas and beds, the perfect place for relaxing and enjoying the beautiful surrounding area. It is a short walk to St Just Church, probably the most enchanting church in the country. Caroline who used to work on Reservations and now in Accounts: "The Engine House, near Portscatho, is beautifully light and airy with great views and near the Cornish Coastal Path. The Aga in the kitchen and the wood-burning stove in the lounge keeps the cottage toasty warm." Jennie, Reservations: "If you want to be a stones throw from the seafront yet tucked away from the hustle and bustle, then Cobblestones in St Mawes is perfect. It's a really cosy cottage, beautifully refurbished and right in the heart of the village." Lucy, Director: "Mine has to be Tideway, in St Mawes. For the great open plan style kitchen/dining/sitting area leading onto a wonderful deck. Lovely views and tasteful decor."